The original explanation I heard for the meaning of SPF was that it allowed you to stay out in the sun longer by a certain factor. My friends and I initially interpreted this as, if you were going to stay out in the sun an hour, you could stay out two hours with an SPF of 2. Or 10 hours with an SPF of 10. An SPF over 24? That meant you could extend your life by adding hours to your day. Like MPG, SPF is a hard number to build good intuitions around. The right interpretation of SPF is that, if you want sun damage of X amount, you can now stay N times as long to get the same X sun damage. You want a an hour of sun damage? At an SPF of 10, you can stay out10 hours and get the same amount of sun damage as one hour. But most people don't have in mind a level of sun damage they want. Instead, they have in mind a time that they want to spend in the sun. As with MPG, SPF is better understood once it is flipped. Flipping it reveals that there are surprising diminishing returns. 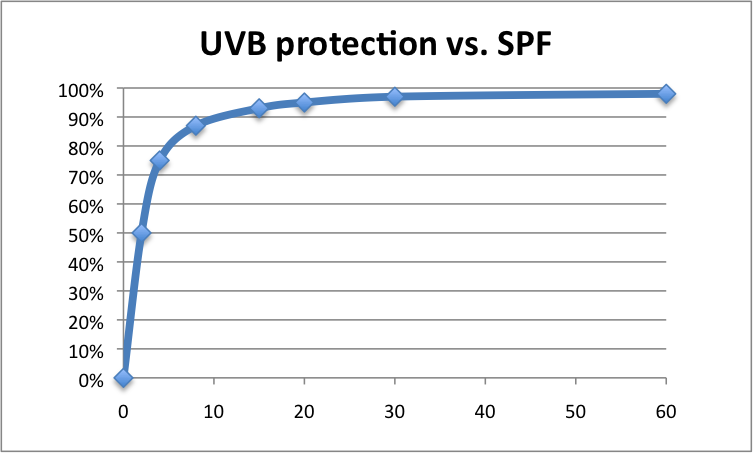 As SPF numbers start to sound very impressive, growing from 30, to 45, to 60, to 100--and the price grows as well--the actual increase in skin protection is negligible. More after the jump. An all-electric Nissan Leaf in Buffalo, N.Y., emits relatively few greenhouse gases, equal to the amount produced by a gasoline-powered car getting 86 mpg. But in Denver, the same Leaf is equivalent to only a 33-mpg vehicle, such as a subcompact Ford Fiesta. When offered the possibility of 33% off a product or the same product with 33% more quantity, which would you choose? 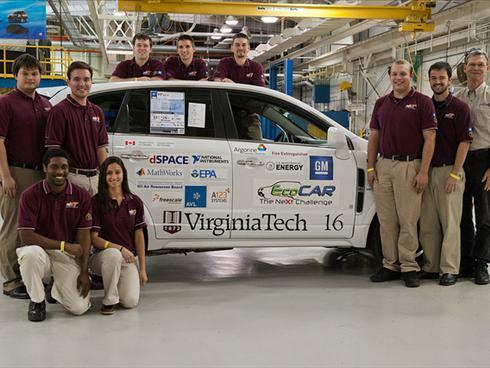 Why not make a whole bunch of 50-miles-per-gallon cars? John Peterson has a grim analysis of the prospects for electric vehicles: The cost of batteries are so prohibitively high for the foreseeable future, they cannot pay for themselves even if gas were $10 per gallon. He concludes that "even with $10 gasoline and sunshine, lollipops and roses battery cost figures, the Return on Incremental Battery Investment (ROIBI) falls off a cliff as soon you move beyond the Prius"
Exactly. Then invest in energy savings in homes, truck fleets, etc. Republicans have created a bill that will provide a $1 billion reward to the first automaker that can sell 60,000 cars that get 100 MPG -- using regular gasoline. No MPGe here. That's right: The Focus saves the equivalent of .03 gallons of gas every 100 miles compared to the Leaf. For these comparisons of efficient vehicles, "miles per anything" is a marketing gimmick. *Note: And, as we've noted before, MPGe is a poor metric. Besides having the wrong number on top (thereby perpetuating the bad math done with MPG), it has a highly uninformative number on the bottom: An energy unit that is equivalent (hence, e) to a gallon of gas. But this energy unit could come from regular gas, natural gas, electricity made from hydro, electricity made from nuclear, or electricity made from coal, all with different implications for GHG emissions. And the electricity could cost 22 cents per kwh in Connecticut or 6 cents per kwh in North Carolina. "The price of gasoline keeps rising for Americans, but it's not because of rising demand from consumers.Since the first Arab oil embargo of the 1970s, the U.S. has struggled to quench a growing appetite for oil and gasoline. Now, that trend is changing. "When you look at the U.S. oil market, you see that there's actually no growth," says Daniel Yergin, chairman of IHS Cambridge Energy Research Associates. He says gasoline demand peaked in 2007 and has fallen each year since, even though the economy has begun to recover. "The U.S. has already reached what we can call 'peak demand.' Because of increased efficiency, because of biofuels, we're not going to see growth in our oil consumption," Yergin says. One of the reasons for the change? People are buying car-based "crossover utilities" instead of truck-based SUVs. Rebecca Lindland, director of research for IHS Automotive, says 27 percent of the new vehicles sold in 2011 were smaller, lighter, car-based versions of the SUV, called "crossovers." "Those tend to get significantly better fuel economy than our traditional truck-based SUVs that used to account for 20 percent of all the vehicles we bought," she says. Now, those big SUVs are less than 5 percent of sales, and the average fuel efficiency of the crossovers is 20 to 30 percent higher than the old SUVs." This is where the national gas savings are available: Exchanging a 16 MPG SUV for a 25 MPG Crossover. Heather Peters sued Honda in small claims court because her Honda Civic Hybrid did not deliver the 50 MPG promised on the window sticker. Peters reported that "'the car never got more than 41 or 42 even on its very best day.' She said the fuel economy dropped below 30 mpg after a software update intended to prolong the life of the car's battery and improve performance." 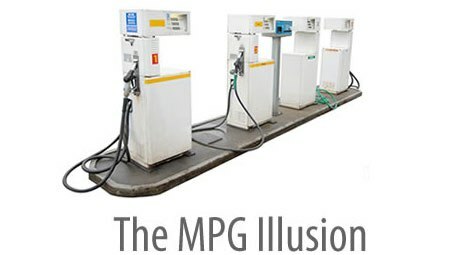 This case reveals one of the problems caused by MPG. 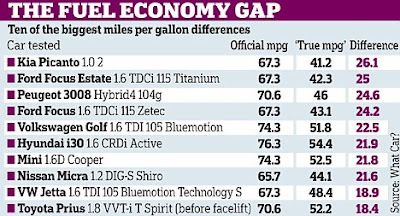 EPA ratings have historically overstated actual MPG (i.e., in "real" driving conditions). This problem was addressed in a 2008 reform. Nevertheless, it persists. When drivers expect 50 MPG and get only 40 MPG, the difference feels very large and disappointing. But the difference in gas consumption is not nearly as consequential. That different between 40 and 50 MPG is 5 gallons of gas every 1,000 miles. Assuming a car has a life of 150,000 miles of driving, that's 750 gallons of gas, which adds a little over $2,500 in costs at $3.50 a gallon. The difference between 33 and 50 MPG is 10 gallons of gas every 1,000 miles, which adds a cost of $5,000 over a 150,000 miles of driving.